Two major events are to be held in Bangkok at the end of September 2009 to capitalize on the global popularity of Thai cuisine, boost exports of Thai agricultural products, and help visitors enjoy a higher quality of culinary experience across the vast range of dining options in the kingdom. The two major food events “Amazing Taste of Thailand” and “Thailand Brand” will be held concurrently between September 24-28, 2009, jointly organized by the Tourism Authority of Thailand, Department of Export Promotion, Thai Hotels Association, Association of Domestic Travel, and Thai Restaurant Association. Thai cuisine is popular all over the world because it is nutritious, delicious, and inexpensive. 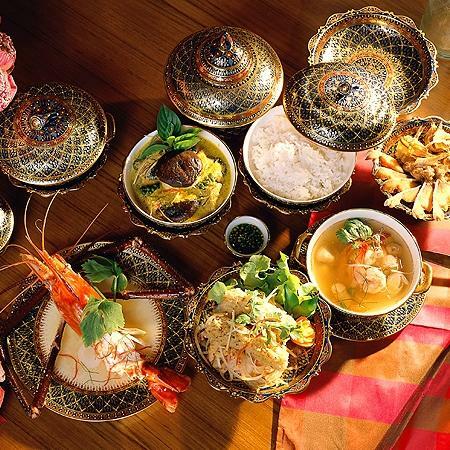 According to Thailand’s Ministry of Commerce, there are plans to increase the number of Thai restaurants overseas from 13,000 locations in 2009 to 15,000 locations in 2010 as part of the second phase of Thailand’s “Kitchen of the World” project, aimed at boosting Thai food exports. Many of the Thai restaurants, ranging from elegant, up-market outlets to fast-food take-aways, are set up by Thai expatriates living abroad, Thai wives of expatriates, former students, as well as overseas entrepreneurs who simply fell in love with Thai food. In addition to the fact that many thousands of visitors come to Thailand to learn how to cook Thai dishes, food and beverage consumption is an important component of visitor expenditure in Thailand. In 2007, visitors to Thailand spent an average of 4,120.95 Baht per person, per day, of which 731.10 Baht or 17.74 percent was on food and beverage. “Amazing Taste of Thailand” will be held on September 25-27, 2009 at CentralWorld Bangkok. It will include exhibitions of Thai cuisine and food products from all four regions of Thailand and provide opportunities for trade visitors to do business. It will feature demonstrations of Thai food products nationwide and cooking classes by chefs from all four regions who will create their special dishes, including main courses and desserts. There will be also contests of Thai food decoration, famous menus of movie stars and celebrities, entertainment activities, and Thai cultural shows. The other event is “Thailand Brand,” which will be held between September 24-28, 2009 in Bangkok and other main tourist destinations in Thailand. This event is aimed at chefs and owners of Thai restaurants abroad and media who will be taken on a culinary tour of Thai tourist destinations in all five regions to interact with local restaurant owners, chefs, and companies involved in the production and distribution of Thai agricultural products. They will provide tips on how to operate overseas Thai restaurants and better market Thai ingredients and food products abroad. In turn, they will be briefed on ways to better utilize their Thai restaurants as marketing channels to attract more visitors and create higher awareness about Thai tourism attractions. About 500 participants will join this campaign, including owners, managers, chefs of overseas Thai restaurants, famous chefs from many parts of the world, and food critics and writers. All have been carefully selected by overseas TAT offices and will also participate in the “Amazing Taste of Thailand” event. For the latest updates, please visit www.TATnews.org.